The starting process of the therapeutic relationship within the group is much the same as individual Dramatherapy, getting to know each other, establishing trust and a sense of safety. The first intention for the group is to provide a safe space in which individuals can feel supported, identified and empathised with, giving the space and freedom to relate to their experience in an authentic way. Being in a group also helps each individual to feel less alone as they will experience commonalities with other members, lending to a feeling of being understood. The first few weeks of the group will focus on getting to know each other and myself and together creating a consistent space where each person can feel safe enough in to address difficult feelings. By playing creatively together, through imagination and improvisation we will explore our dynamics as a group and come to relate to each other in an open, honest and sincere way. 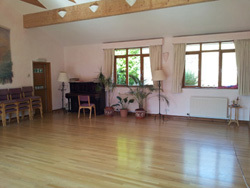 As with individual Dramatherapy, sessions will include a ‘tune in’ and tune out’ at the beginning and end of each session to allow any difficult issues or dynamics to be held safely within the space, providing an opportunity to de-role where necessary and contain anything difficult that has emerged. Between this ‘ritual’ the content of the sessions depends greatly on the needs of the individuals and the group as a whole at that particular time. After a tune in, it will become clear what is important to be addressed within the group which can vary from collective experiences or shared themes to a particular need of one individual. We will use a variety of creative tools to explore this together. They will greatly depend on the nature of issue being addressed and the individuals present but will include dramatic exercises, improvisations, myths and stories, fabrics and costumes, music, movement and art. Sessions can be between 1.5-2 hours but can be extended if participants feel the need and are all in agreement with this.